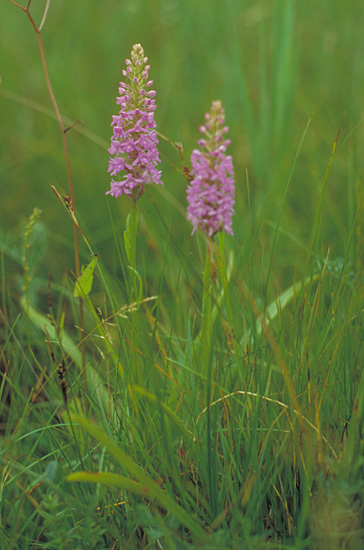 Unfertilized, grazed calcerous fens are often very rich in plant species and a lot of orchids can be found. One of the characteristic species in calcerous fens is Epipactis palustris - seen in the right picture. It is still quite frequent in some parts of Denmark - especially on Seeland. In Jutland good developed calcerous fens are rare and the best examples are found along the coasts where there are calcerous shells in the ground e.g. along the westcoast. Due to more high lying lime in the soil of the Danish Isles, calcerous fens can be found a long way from the coasts. 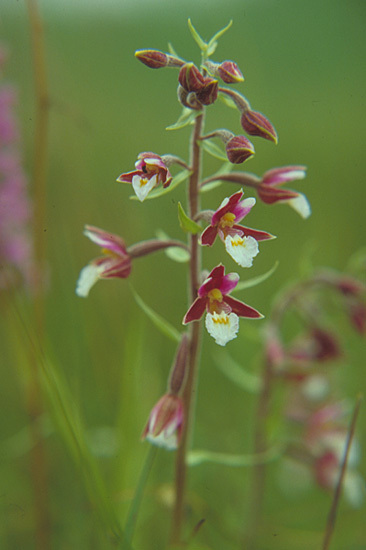 Several rare species of orchids can be found in the calcerous fens. Gymnadenia conopsea on the left picture (here var. densiflora) now have only a few sites on the danish isles. Also Dactylorhiza incarnata supsp. ochroleuca has become very rare, while Liparis loeselii and Herminium monorchis still can be found in several places. Carex hostiana and Carex flacca. In 2005 the very rare Schoenus ferrugineus was discovered in 2 new places and now has 3 places in Jutland in calcerous fens and a pair on Seeland. The relative also found i calcerous fens - Schoenus nigricans - has a few sites in Jutland and a single site on The Funen. Back to North Western Seeland.